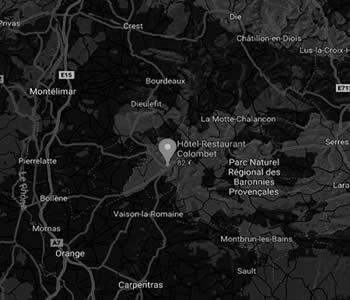 Rates of the Hotel Colombet *** in Nyons. Rooms rates. Season, VAT and service included. Tariffs Low season available on request by e-mail or telephone. The hotel is closed for works from the 15th of December to the 31st of January. * Number of bedrooms for each type. All the bedrooms with bathtubs or showers which are South facing (onto the square) are fitted with individual air conditioning units. Garage (with prior booking) : 11 € per vehicule per day. 5 € per motor-bike per day. 1 € per bike per day. Tax : 0,80 € per person per day. Meal times: from 7.45 am to 10.00 am, from 12.15 am to 1.30 pm and from 7.15 pm to 8.30 pm. VAT 10% (except garage 20%) and service (15%) included. Breakfasts : 12 € per person & per day. Breakfast served in the rooms is made up of a hot beverage (50 cl), a third of a baguette (or toast), a croissant, a glass of orange juice (10 cl), butter and jam. In the salon, the breakfast is served buffet style. FULL PENSION : + 21 € per pers. / per day.